My husband plays in a bigband. 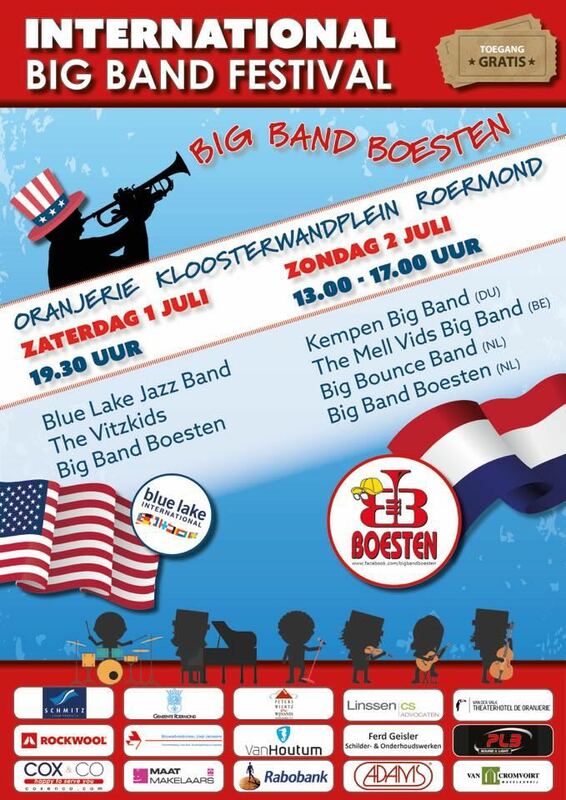 For the fourth time they organized the International Big Band Festival in Roermond. Mostly the international bigbands are from Belgium and Germany. One of the bigband’s group members was once on a Bleu Lake Fine Arts summer camp in the US. His father received in the past Blue Lake International Jazz Band in the Netherlands. It was his idea to invite them to play on the festival. They asked and Blue Lake agreed to come! Music connects, but not all by itself and sometimes there are blockades. This blog is what I experienced this time on how to structure connection, the work that needs to be done to create the moment where the magic might happen. I write about it because I learn from it, learn about the keys to succes to organise moments where magic might happen. To make sure structures don’t block the flow but enable, support, enlarge it. On sunday, the music connects. their are 4 bigbands playing. 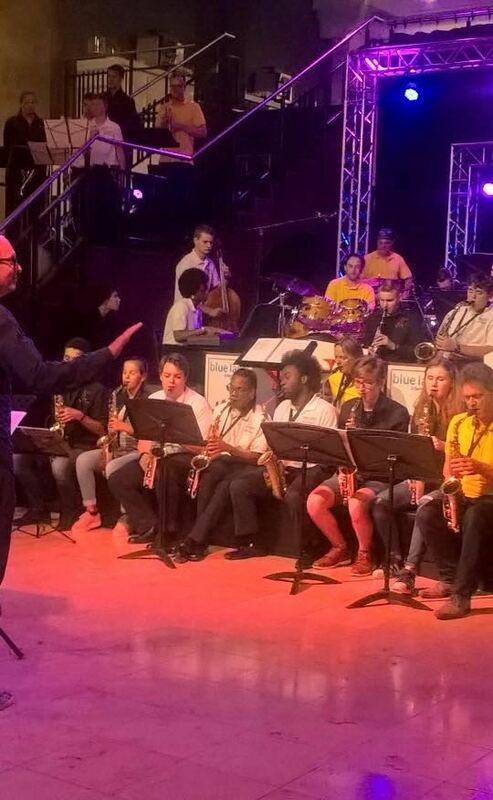 So around 80 musicians had a great time playing with their band for an audience. The band members in playing together. The audience, musicians, in enjoying the music and meeting each other. A volunteer picked the bigbands and invited them to come. Agreements were made. The bands receive a fee for playing (to support the bands “long-term survival”). All licenses were applied for, requirements met. A poster was made and all other (social) media mobilized. The stage is good. Good sound- and light-support in a nice environment. There is catering while listening. There is place for the musicians to leave their stuff while waiting. Someone is watching the time so the bands can start on time and presenting the bands to the audience. The audience can enjoy this for free as there are sponsors found to pay for the expenses. On saturday music CONNECTS. 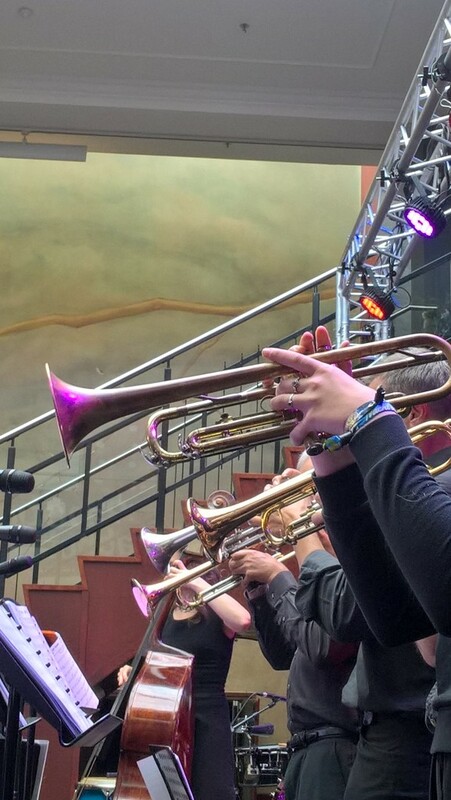 During the concert of the three bands, there was a vibe of collaboration, challenge and connection. The band members in playing together. The band members in playing with another conductor. The conductors having a solo on their instrument with another band. The trombonists of the three bands in playing together one piece, and having all solo’s. The trumpeters of the three bands in playing together one piece. Part of the audience, being a host family, with the American band. The audience, musicians, in enjoying the music and meeting each other. Having conductors supporting the collaboration, picking nice challenging combinations from all bands for the improvisation solos. Having conductors picking pieces for their conducting the other band, conducting the one instrument pieces. Having a program (time schedule and rooms) for the workshops that are needed to rehearse all the combinations. Having host families that have a connection to music. By preference with a kid, same age same instrument, as the guest. The American band that teaches their students (by a set of rules) how to be a connecting visitor in the guesthouse. Last minute buying of yellow t-shirts for one band so each band had his one color and could easily be recognized. The mixing of band members was visible. The American conductor listening at breakfast to the cellist in the guesthousehold and asking him to join the band for the concert the next evening. A challenge for the cellist and an unusual combination for the band. The conductor showing guts and trust at the same time. All conductors on the watch for opportunities for personal growth for the musicians. I saw people (musicians and audience) having a great time in being connected. And the chance of that happening is increased by the structure provided. Mostly invisible work done by people who enjoy to feel this happening. Reading back I realize this is quite a technical story. But that was exactly what I was looking for.